I am Sister Nicole Kunze, prioress (or leader) of Annunciation Monastery. I was elected prioress last April by my monastic community. It is hard to believe it is almost a year since I left the chemistry classrooms and labs here at the University of Mary for the role of prioress at the monastery. It was hard to leave the classroom, but I’m enjoying my new job and the opportunities and challenges it provides me. I’m grateful for the opportunity to spend a few minutes with you this morning to share a bit about our monastic community during Benedictine Awareness Week. Next Friday, our monastery celebrates a special anniversary. On March 24, 1947, the Vatican signed the decree establishing our monastery. So, that means it is our 70th anniversary as an independent monastery in the Diocese of Bismarck. Our Benedictine foremothers had been present in Bismarck since 1878, but now the motherhouse would be here, not back in Minnesota. 140 sisters volunteered to found the community and 2 founding sisters are still with us. A lot has happened during those 70 years – the building of two monasteries, founding a university, founding a rural hospital in Garrison, ND, serving the sick at St. Alexius Medical Center, teaching students in elementary and secondary schools throughout the diocese, and serving in parishes and diocesan offices. Serving the people of the region is important to us. The Benedictine order wasn’t set up to do a particular type of work. We help where we are needed. Work is not why we sisters came to the monastery. Our main reason for becoming sisters is that we want to seek God together. We became members of Annunciation Monastery because we want to pray, live, and work with other women seeking a relationship with God and each other. The example of every sister in my community inspires and challenges me each and every day. I have mentioned our past 70 years and the ways we have served. What are we doing today and into the future? I am excited for the possibilities. Ministry on the Margins started three years ago to serve the poor who may fall through the cracks during times of transition. The ministry started in the basement of a downtown office building and now occupies a large building in east Bismarck, serving over 500 people a week with warm food, a food pantry, and fellowship. Some sisters are involved in interfaith groups and assisting refugees who are relocating to this area. The University of Mary and CHI St. Alexius Health and their employees continue the mission of serving all as Christ started by our sisters. We have women coming to join us. The possibilities are great. We remain faithful to our mission, vision and values. We trust that God will be with us. We trust each woman walking alongside us. We remain true to our Benedictine heritage and are committed to being a prayerful presence on these prairies for years to come. 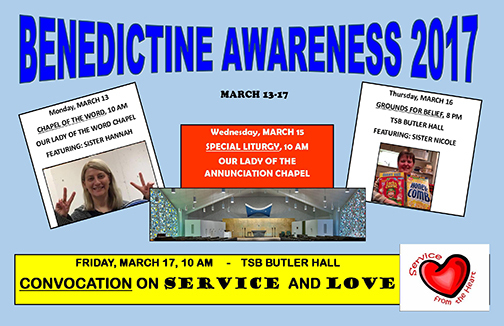 During Benedictine Awareness Week we invite you to get to know us better by attending the other activities we have planned. On Thursday evening, I will be the main speaker for Grounds for Belief at 8:00 pm in Butler Hall. The title of my presentation is Benedict, Benzene, and Baseball. Come see how those three topics are a part of my life. On Friday morning at 10:00 a.m. in Butler Hall, the sisters’ convocation will be on Service. In a dynamic presentation of speakers and pictures, we will share with you how we live out the Benedictine value of service. Thank you for everything you do, whether you are a student, faculty or staff member, to live out the Benedictine Values and pass them on to others.